Fayette County birth, death, and marriage records (1917 to the present) are available from the state Health Statistics Center. The cost is usually $12. For vital records before 1917, including divorce records, see the Fayette County Clerk. Only family members can obtain non-public records; birth records after 100 years, and death and marriage records after 50 years, are usually made public. 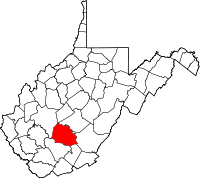 Fayette County was founded in 1831 from parts of Greenbrier, Kanawha, Logan, and Nicholas Counties and named for the Marquis de Lafayette, great supporter of the American Revolutionary War. The area now known as Raleigh County was later removed from Fayette.